Well done to Katelyn who was awarded this terms Friendship Award for demonstrating her kind and caring nature to those both in her class and around the school. 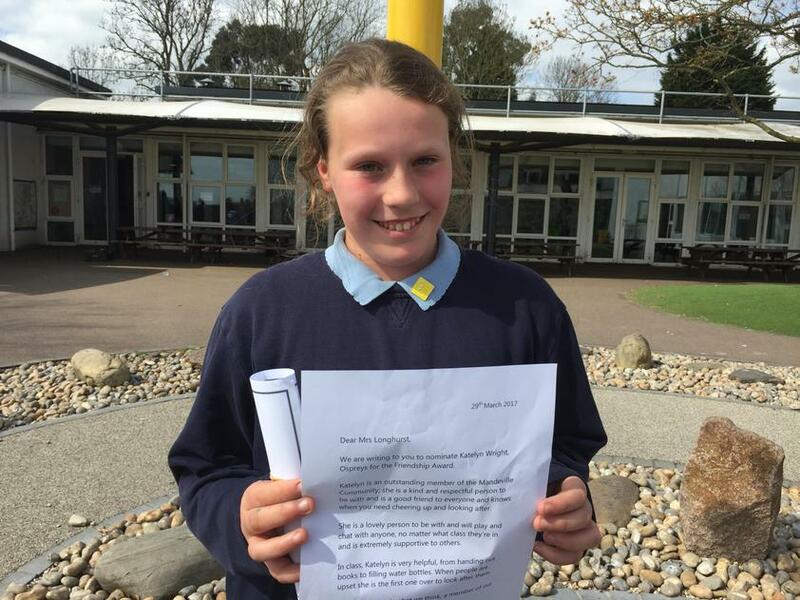 Katelyn was nominated by two of her class mates, Emily and Olivia along with her class teacher Miss Lawrence. Katelyn was described as being an outstanding member of the Mandeville Community who is kind and respectful. She was said to be a good friend to everyone and knows when you need cheering up and looking after. She recognises when people are upset and she will be the first one over to to look after them. Well done Katelyn on receiving this award especially as her sister Libby received it two years ago.